Chandler and Hana ❤. Chandler has comfirmed that he is now dating Hana Hayes on his Ask.fm!! I ship and support #Chana! Please STOP the hate and let them be happy they don't deserve this hate 😭. 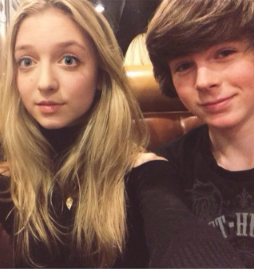 Wallpaper and background images in the Chandler Riggs club tagged: chandler riggs 2014 selfie hana hayes. This Chandler Riggs photo contains porträt, kopfbild, nahaufnahme, portrait, headshot, and kopfschuss.